If you have ever attended a Brookfield AAZK function over the last several years you have probably seen Sarah Love. She is one of the most active members of the group. 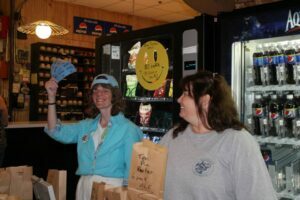 She attends most of the events and helps out by selling raffle tickets, minding auction tables, decorating for events, and much more. Sarah is not a zoo keeper but she does work for the Chicago Zoological Society (CZS) in a job titled “Development Associate”. This job title really does not tell you much about her work. What she does is Prospect Research. That entails researching fundraising prospects for the CZS Development officers so they can spend their time cultivating the right people for donations to the zoo. She also acts as the “information guru” keeping everyone in her office apprised of what is going on in the worlds of finance, politics, and society as they relate to individual prospects that CZS is pursuing. In addition she writes all the Chicago Board of Trade (CBOT) Fund solicitation letters as well as all of the standard templates for CZS donor thank you letters. A pretty vital job to say the least. Building paper mache animals for Enrichment Day. In early 2005 Brookfield AAZK sent out an email notice to all of the CZS staff introducing the Brookfield AAZK Chapter and inviting any interested staff to join. They solicited not only keepers, but also other CZS personnel and volunteers. 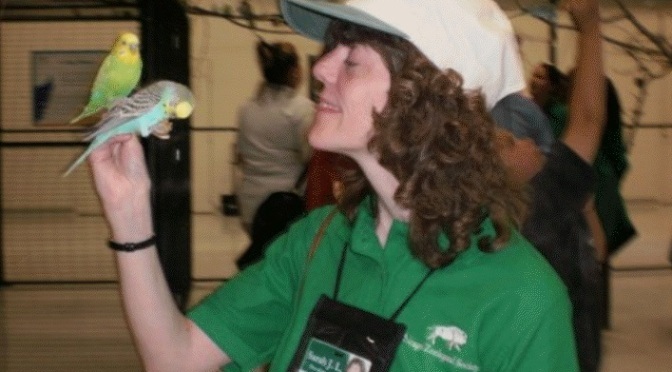 Sarah “jumped at the chance” to join a club for zoo keepers. Selling raffle tickets at Bowling for Rhinos. So why would someone with Sarah’s background join Brookfield AAZK? Well Sarah has a couple of reasons. She felt since she could not take care of the animals herself, she wanted to do as much as she could to support the people who do. This way she felt she could still “positively affect animal care without lifting a shovel or a hose”. Furthermore she thought that her “best chance to get up close and personal with the animals would be to get up close and personal with the keepers”. Sarah started going to the meetings and was quite surprised to find out that she was the only non-keeper attending. “I thought everybody would want to be involved”. At first, she felt a little like the “odd man out”, but the other members of the chapter were nice and welcoming to her, so she stayed . . . and the rest is history. 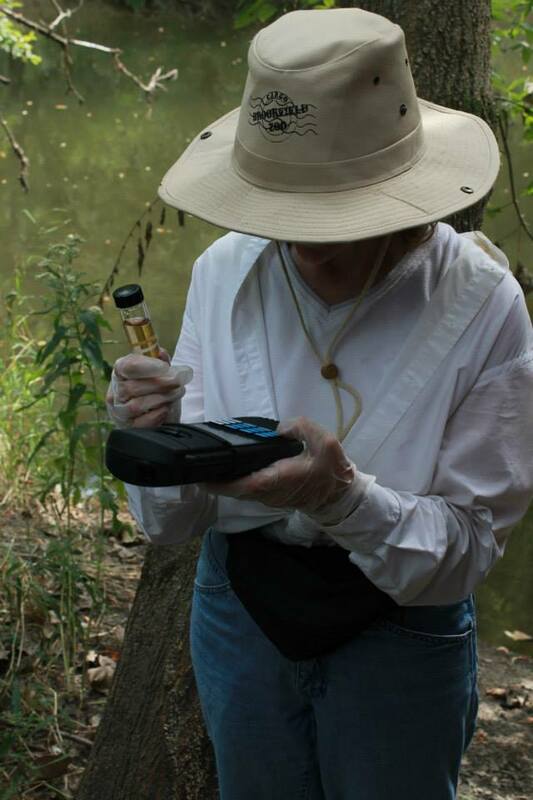 In recent years, Sarah has regularly coordinated the Salt Creek Cleanup, a very important event sponsored by the Brookfield AAZK Chapter that helps our local environment. 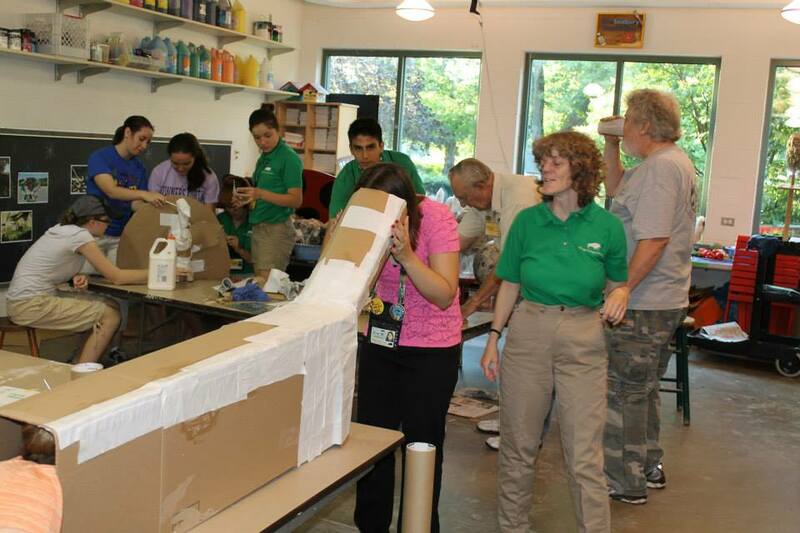 At the 2014 event, in addition to the usual Zoo staff and volunteers, she needed to co-ordinate 27 volunteers from a major corporation into four groups that picked up trash along Salt Creek within the Brookfield Zoo grounds. Over 40 bags of trash were collected and once again Salt Creek is looking great. Sarah’s favorite Brookfield AAZK event is the Spaghetti Dinner that is held every year and benefits Vital Ground. Vital Ground is an organization that works cooperatively with landowners, local communities, and state and federal agencies, and addresses the issue of habitat fragmentation head-on by permanently protecting crucial lands for the benefit of grizzly bears and other wide-ranging wildlife. It is not hard to understand then why one of Sarah’s fondest memories and highlights of working with the Brookfield AAZK chapter happened in late June of 2010 when she was able to travel to northern Idaho with four of the keeper members to see firsthand the work and achievements of Vital Ground. She was disappointed they did not see any bears “except for one who was made of Styrofoam”, but they did see plenty of evidence that there were bears in the area. When it comes to animals, Sarah loves them all. “I love just about every critter on earth, including bats, rats, spiders, snakes, and most bugs . . . but not mosquitoes.” Her two favorite animals however reside with her every day. They are her two black and white “Jellicle” cats . . . 14 year old Pinwheel and 9 year old Muppet. I am sure these two little guys get lots of attention when Sarah returns home. So when you come to your next Brookfield AAZK event look around for Sarah. Chances are she will be somewhere in the area helping out with whatever needs to be done as she always does. When you see her, say “hello”, ask her about Brookfield AAZK and what it means to her, and what she knows it means to all the animals that benefit from the work that she and all the members of this chapter do for them. We at Brookfield AAZK know how much Sarah means to us.